The first swimming baths at Drummoyne were opened in November 1899, close to where the current pool is located. It was a floating timber structure, moored in place by a large punt that allowed the platform to be lowered or raised depending on the tidal flow of the Parramatta River. The baths were reserved for ‘the convenience of ladies’ from 11 am to 3 pm. In 1904 a permanent structure was built at a cost of £3000. The pool was cut out of solid rock with a concrete wall erected to keep out seawater. It is one of the oldest Council pools in Sydney. Over the years there have been many alterations and renovations to maintain the standard and quality of the pool. It has been both an enjoyable place for the local community and an important training pool for some of Australia’s best known swimmers, including Dawn Fraser, Jon Henricks and John Konrads. 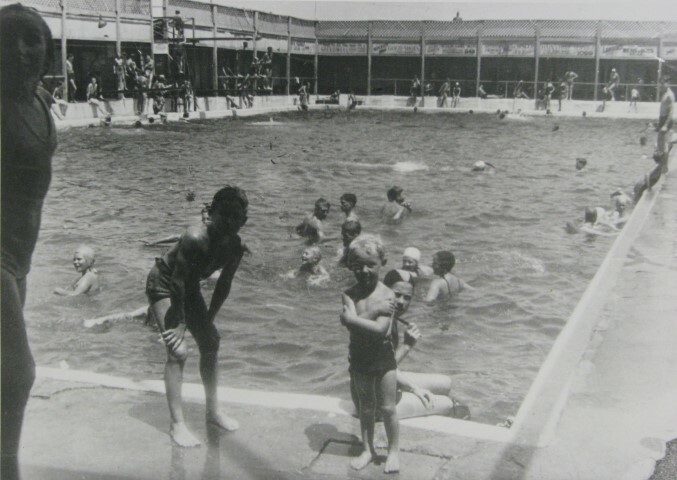 The photograph shows Drummoyne Pool in 1949. Matthew Fairless lived and worked on the Yaralla Estate where he was the Herdsman. Yaralla had a herd of prize winning Jersey cows which had been built up through selective imports from Britain in the early 1900s. His wife Fanny also worked at Yaralla as the Head Housekeeper. Matthew Fairless died on the 22 November 1931, aged 63 years. The photograph is from an album, ‘Concord Plaques and Public Places’, compiled by Marge and Tom Breaden in 1999 and donated to Local Studies last year by their son. The photographs are being digitised and added to ‘Canada Bay Connections’. Over the years Drummoyne Oval has hosted some great cricket matches. 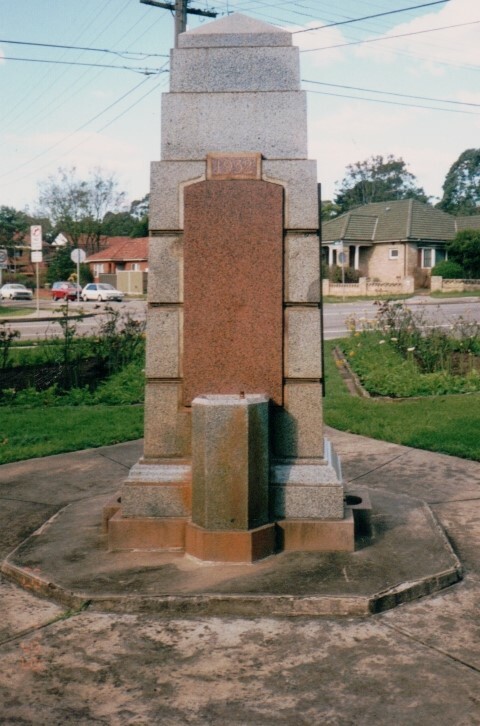 Drummoyne Oval was constructed during the Depression with a grant from the unemployment relief fund in 1930. Equal in size to the Sydney Cricket Ground, the Drummoyne Oval has always been used for rugby in the winter months and cricket over summer. 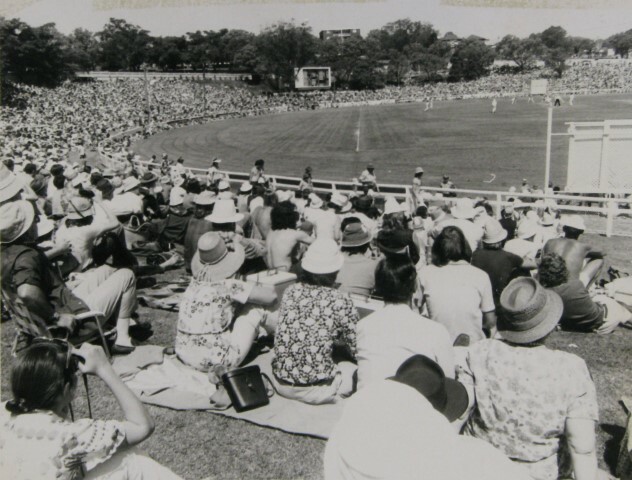 The photograph, above, shows a cricket match between Ian Chappell’s Test XI and John Benaud’s Rest of Australia which was held at Drummoyne Oval on Sunday, 8 October 1972. The match was promoted by the Balmain Cricket Club and the Spastic Centre of NSW. An estimated 20,000 people attended the match. 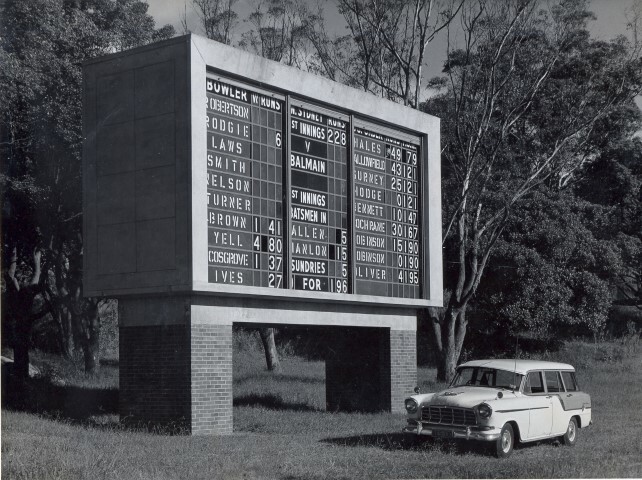 The scoreboard at Drummoyne Oval was first used for a cricket game on the 7 January 1961. At the time it was described as ‘the best suburban-ground scoreboard in the metropoltan area’. It was designed by local architect Stan J. Nichols and cost £4600 to build. Originally scores were changed by hand but it has since been upgraded with an electronic display. Made of prestressed concrete, it will certainly be keeping score at Drummoyne Oval for many years to come.